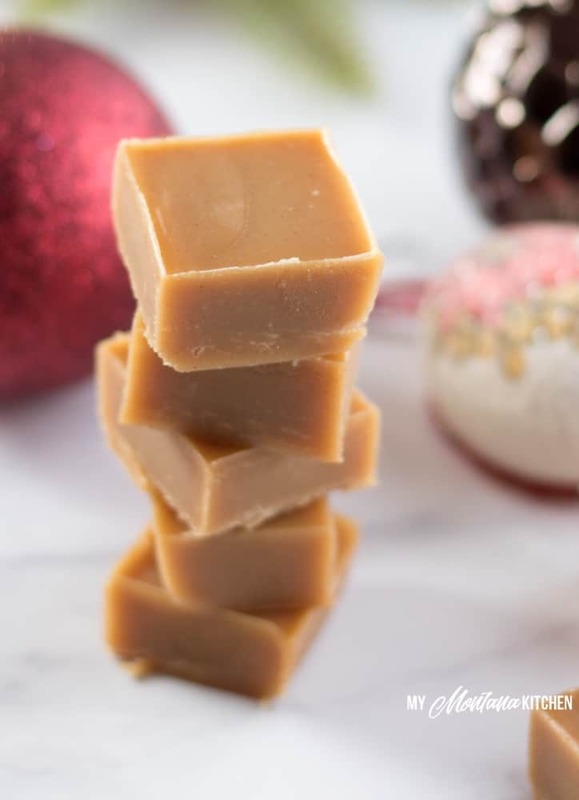 This rich low carb peanut butter fudge is easy, tastes delicious, and no-one will no it is sugar free (and only 2 ingredients)! 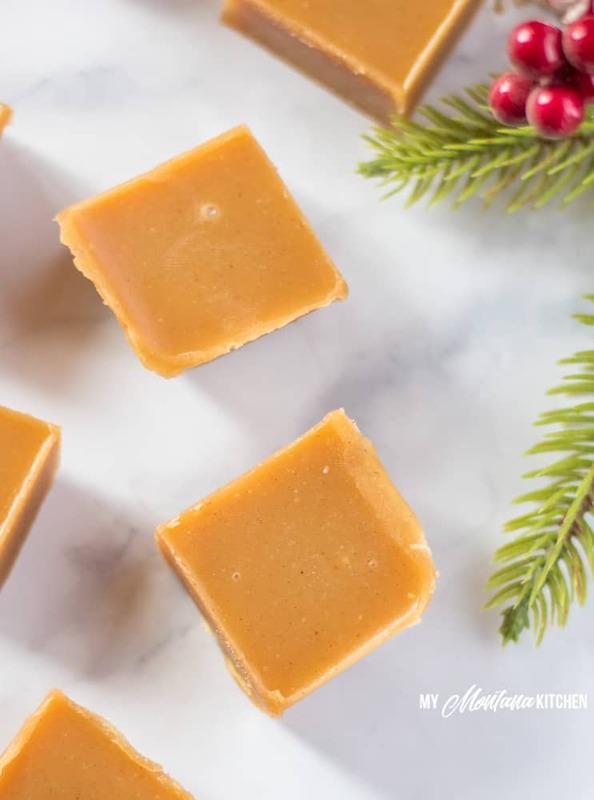 With only two ingredients and 2 net carbs per serving, this peanut butter fudge recipe will have you out of the kitchen and spending time with your family in no time! 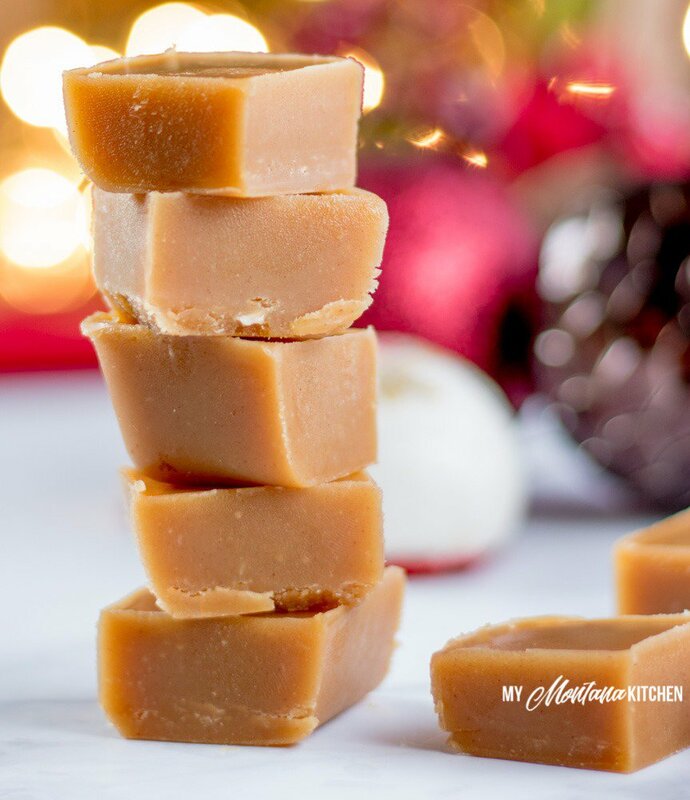 Fudge has always been a special tradition in my home, but this fudge is low carb, sugar free, and can be enjoyed as a Trim Healthy Mama S Fuel! Growing up, our neighbor would bring us beautiful little Christmas tins filled with two different kinds of fudge – chocolate and peanut butter. Back then, I would have been hard pressed to say which flavor was my favorite, but now I would definitely say peanut butter! My 2 Ingredient Chocolate Fudge has been such a popular post, that I knew you guys needed to have a peanut butter option as well! All you need some of my Low Carb Sweetened Condensed Milk and natural peanut butter. Really! How much easier can it get? But I have a confession to make. This recipe is 2 ingredient ONLY if you already have the condensed milk already made. If you make the Low Carb Sweetened Condensed Milk ahead of time and store it in the refrigerator, it will harden and become firm. 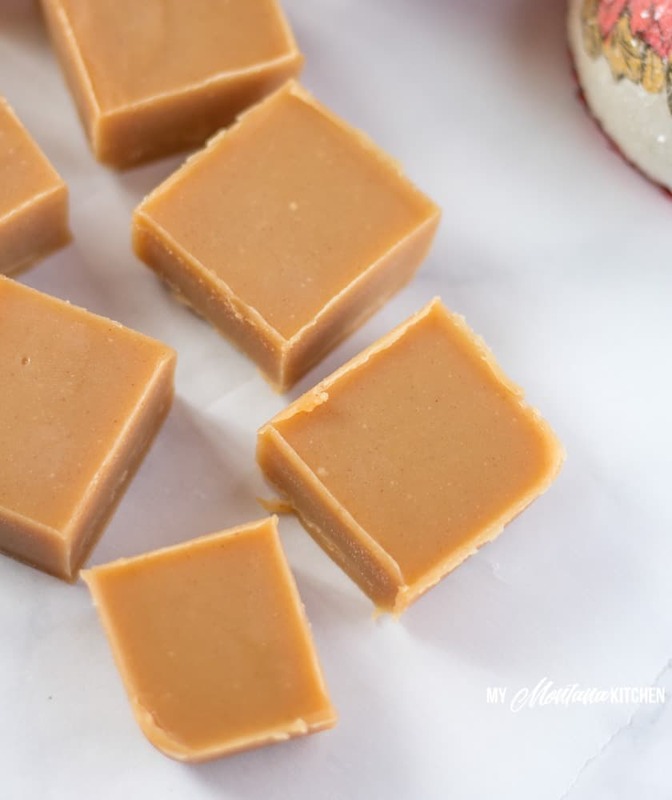 To make the peanut butter fudge, simply remove the condensed milk from the refrigerator and nuke it in the microwave for about 10 seconds, then give it a good stir. Then place the desired amount of condensed milk into a bowl, add the natural peanut butter and mix well. Then pour the fudge mixture into the desired container, and place in the freezer to firm. This fudge is a little more of a soft set than the chocolate variety, but I think it is much more creamy. I put the fudge in the freezer (or on my front porch – we can do that in Montana) to harden initially, but I usually store it in the refrigerator. You do not want to leave it out at room temperature, because it will completely soften and become gooey. If peanut allergies are a concern, I believe you could use almond butter or Sunbutter to replace the peanut butter (using equal amounts). 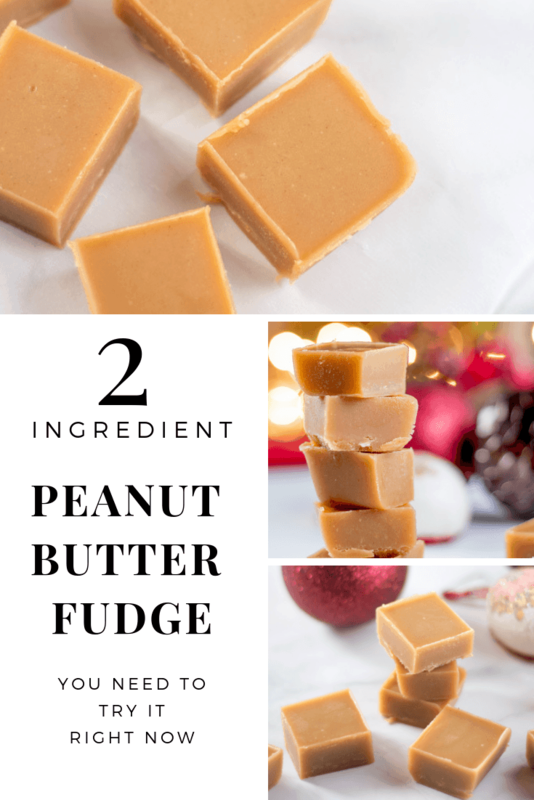 You could also make this peanut butter fudge dairy free by using my Dairy Free Sweetened Condensed Milk in place of the regular sweetened condensed milk recipe. I use the Adams brand of natural peanut butter (the no-stir variety). You can see which kind I use by clicking here. 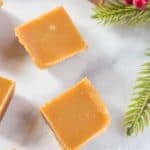 I would never be ashamed to take this keto peanut butter fudge to a party or give it away as a gift! I won’t even tell you how many pieces I ate while I was photographing this post! The good news is that you don’t have to limit yourself to Peanut Butter Fudge. There are many more fudge recipes here on the blog, so be sure to check them out (all of them are low carb and sugar free)! Only 2 Ingredients, and you have rich, velvety, chocolate fudge – but without any guilt! Creamy chocolate fudge topped with a creamy peanut butter layer – it’s the best of both! These dreamy DIY protein bars taste like creamy coconut fudge! Chocolate, Peanut Butter and an amazing superfood – collagen. All combined together to make a delicious and healthy fudge recipe! The flavors of a favorite no-bake cookie, but with all the added benefits of collagen and coconut oil! All of the recipes above are no-bake, which means you can save your oven for cookies (like these Soft Gingersnap Cookies). Combine warm sweetened condensed milk with peanut butter and stir until all is combined. and filled two of the cavities. Cut into pieces (yields 25-36 pieces, depending on how you cut them) then store leftovers in the refrigerator. This recipe makes 24 pieces of fudge. This looks so good! And very easy! I love how simple this recipe is! I’ve never tried peanut butter fudge before but I have no excuse now! How many pieces can we have? Fudge! Fudge! Fudge! I love how simple this recipe is, Sarah. My mother made wonderful peanut butter fudge that I haven’t had in 30 years. Who knew it could be so simple. Thanks. This is so easy, how brilliant. Definitely a must try. This is literally one of the best things I’ve ever tasted. Unbelievable!! The peanut butter taste is just so bright and sharp. Thank you. I ❤️ keto! I’ve been on low carb since March! This is the first desert I e made that is really satisfying:) Love it. Thank you. What is meant by one recipe of the condensed milk? The condensed milk recipe is linked in the recipe card. You should use the entire amount in the fudge. It equals about 1 cup. On a previous post you said the SCM recipe equals about 1 1/4 cup. Does it make a big difference if it’s more than a cup? No, I don’t think the 1/4 cup will make that big of a difference in the fudge recipes. This was amazing, whole family lived it, thanks!!! So I️ made the condensed milk but used 1/2 cup for the Two Ingtedient Chocolate Fudge. So now I’m not sure how much peanut butter I should use for the remainder? ? I think I have approx 3/4 to 1 cup left. Thanks for your help! I made the fudge but it doesnt get hard. This fudge never does get completely solid (like fudge made with chocolate chips). It is much softer, I recommend keeping it in the refrigerator or even freezer for best results. Can I put this in a silicon mold like the chocolate fudge to make smaller shapes? I’d like to then dip them in the 2 ingredient fudge (before it hardens) to make buckeyes. Hi, Can I use your 2 ingredient condensed milk, instead of your 3 ingrdient version? Thanks as always for your wonderful recipes!! Can this be made with the 2 ingredient condensed milk? My “milk” separated as soon as i added the peanut butter to it and started stirring it. My pan of fudge has an oil layer on top. Did i do something wrong? No, that appears to happen at times, but I have never found that it affects the flavor. I would try to stir it well with a whisk to see if that helps. I may just not be seeing it but do you have the carb, fat, protein totals for this? I made it and it is yummy. Thanks. I’m sorry, this recipe was published before I started adding macros to my recipes. Ok, well I am doing this the Whole Foods trim healthy mama style plan. What do you think is the minimum amount of coconut sugar or honey I can put in this? If you had to guess. Thanks so much! Did you try the coconut sugar and how did it turn out? As the wife of a type 2 diabetic and a mom of a type 1, I love that you have low carb fudge recipes! That is one thing my guys have always missed being able to have at Christmas. This year, they’re getting a special treat. Thank you so much!! 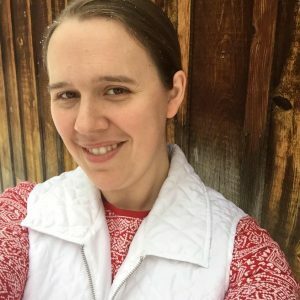 Simple and easy recipes are my favorite recipes! I can’t wait to give this recipe a try, thank you! So yummy! We make many different kids of fudge during the holidays and it makes easy gifts. The peanut butter is divine! Can you make your own peanut butter to use or do you have to use Adams? The Adams brand truly works the best – I’ve tried it with others and they did not yield the same results. I was just thinking about the peanut biutter fudge and my first time making it I used a freshly ground peanut butter from our local Amish bulk food store and it was really oily. So I had thought…how would using 1/2 peanut butter and 1/2 peanut flour work? Sara Montana, have you ever tried peanut flour in fudge with SCM? Probabley have to add more gentle sweet too. I have not tried that, but I think a 3/4 to 1/4 ratio would probably work!